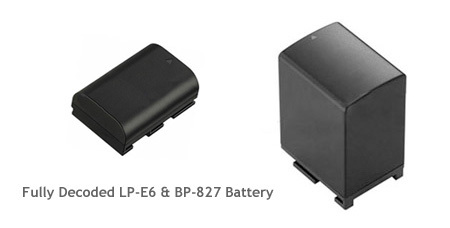 We have two fully decoded Canon compatible LP-E6 and BP-827 batteries that function just like the stock Canon batteries. For Canon 5D Mark II or 7D owners, as well as Canon VIXIA HF HG camcorder owners, if you use any generic brand battery, the camera will give a warning message every time during start up. It will not communicate with the camera to display the remaining battery level. You also cannot charge the generic battery with the included charger. By doing so, Canon can overcharge their Canon branded batteries. We have the fully decoded LP-E6 battery and BP-827 battery. These batteries are made with info-chip, which can show battery power level on camera LCD. It also can be charged by Canon original charger or any third-party chargers. Now you can enjoy using your camera just like using the original battery but paying about 1/3 of the cost of the Canon branded batteries. Posted by mark on 7/10/2010 12:14:00 AM will this huge battery work on a HV20? or do i need to get a BP-2L24H? Replied by LA Color Pros Mark, this battery is not for HV20. You will need BP-2L24H for your HV20.